At the age of nineteen Patia embarked on a one year Art Foundation course at Nene College,in Northampton. She then continued her studies at Harrow College of further Education between the years of 1986 – 1988 and subsequently Cardiff from 1998 – 1990. During her time at Harrow and Cardiff she was tutored by Michael Casson, which lead on to an important few weeks summer experience, at the Wobage Pottery during her second year at at Cardiff. After graduation Patia was generously invited by MIck and Sheila Casson to join the team at Wobage in1990. Which is where she continues to work today. 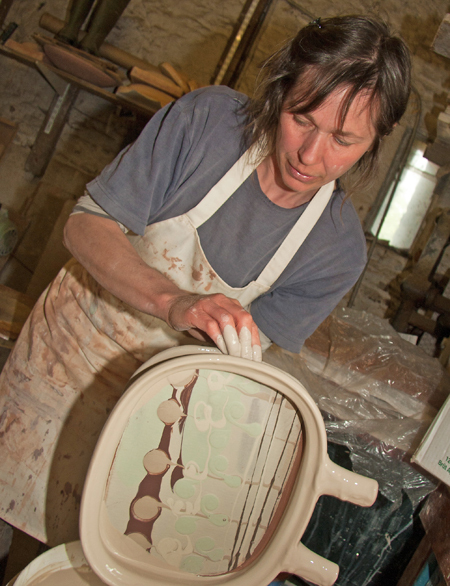 Patia has her own workshop where she makes slip decorated earthenware alongside high-fired ash and feldspathic glazed porcelain. As a single parent the Wobage community was an extremely supportive environment for Patia and her son to live and grow creatively. Patia was made a Fellow of the CPA in 2015, and has exhibited in the UK, Japan and Europe. She has also taught short courses and generously demonstrations in the UK and Europe. 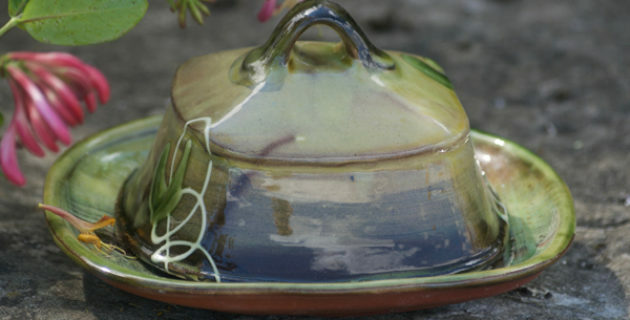 “I make using two very different clays. 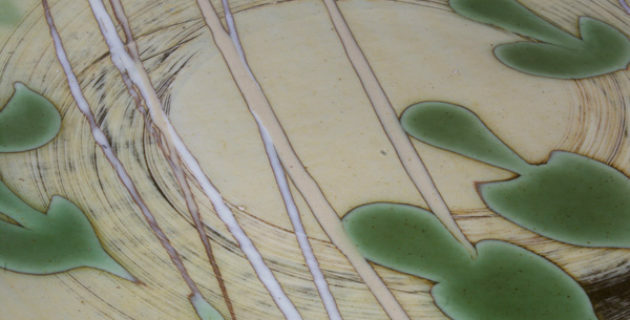 Slip decorated earthenware fired to 1120 degrees centigrade, and high fired reduced porcelain. (Using apple, chestnut and yew ash ). There is a connected thread between the two … pots for living and daily pleasure. The most interesting aspect about working with both materials is that each material feeds different facets of what I love about clay and one informs something of the other when i am working; enriching both I hope. 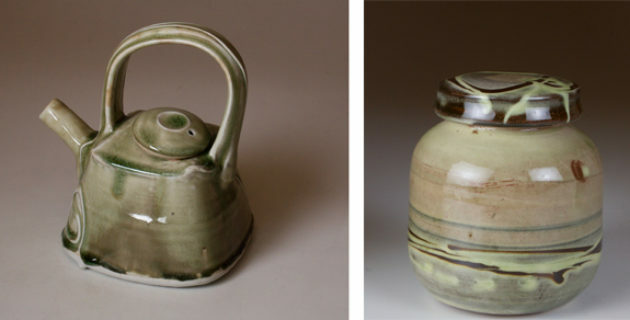 My Earthenware pieces often begin with the clay as the canvas – working slip wet into wet, layer upon layer of pours, drips, trails, feathering, and brush marks with intensity and speed. The joy of being a little more out of control, freer in process has come about in part by using tin cans for trailing slip on both earthenware and porcelain. Ideas are allowed to become something else by the very nature of nature of pouring out the slip through a fine slit, the result being looked at again and thought about afresh; worked on if exciting or cast aside. I’m fascinated by this elusive nature of creativity…. how you sometimes submit either quite loose or preconceived ideas to ceramic process and with free experimentation discover how much more can be gained.